It's that time again! 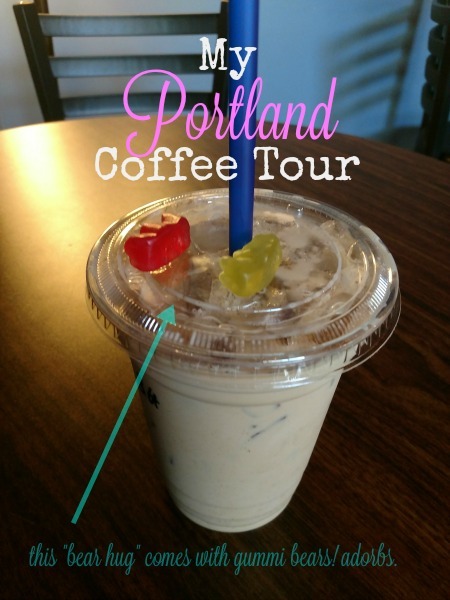 Yep, time to talk about the awesome caffeinated beverages the Pacific Northwest is best known for: coffee. 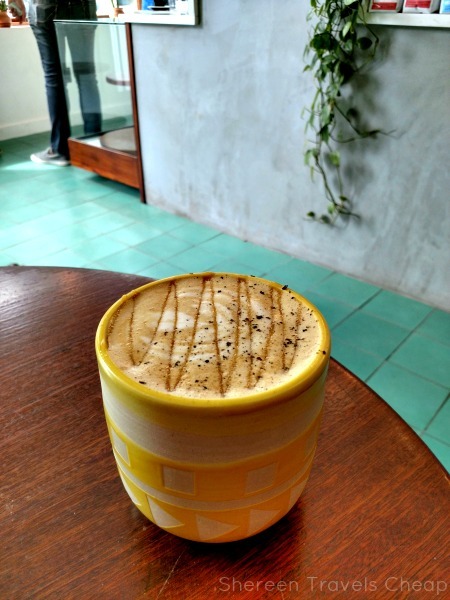 I've got to admit that I went to way more coffee shops this month than probably recommended, but that just means I can tell you about the lovely roasts available in our fair city. Unfortunately, you're still only going to get three this post and another three in next month's post. You can follow me on Instagram to check out my visits when they actually happen though. I'll wait while you go hit that follow button. 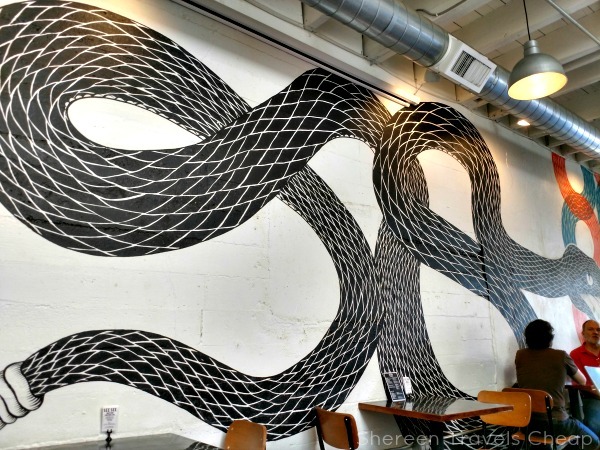 I've been longing to visit Tōv for a while. 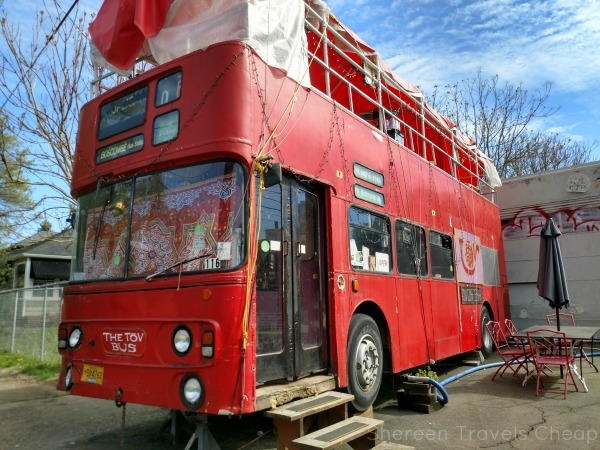 It's a coffee shop that's actually in a big red double-decker bus. It's run by an Egyptian fellow and while you can get all your regular favorite flavours and brews, I was in it strictly for the Egyptian coffee ($3). The cups are tiny, but the flavor is big and bold. It comes on a custom-made tray and includes a side of Turkish delight. 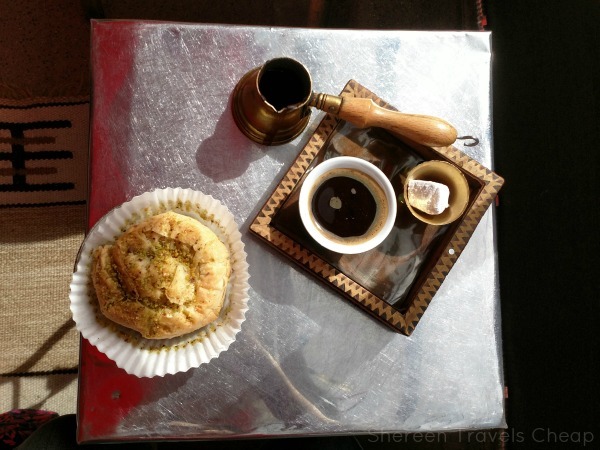 I also ordered a pastry called Ba'alawa ($2.50) that was like a large baklava. Very messy, very delicious. I sat up on the upper deck to enjoy the great weather we were having and was served pretty quickly and given a little tutorial on how to best drink my beverage. Basically, you pour from the tiny coffee pot to your tiny cup, let the grounds settle (because these are purposely not strained) and then drink black. I was dubious, but once I took a sip, the flavours came out and it took me a bit to not drink it all in one go. It's a sipping beverage and, though it was recommended I save my sweeter pastry until after, I found it complemented well. After your coffee, you have your Turkish delight to cleanse your mouth of harsh coffee taste. I've had it before and was not a fan, but obviously I had not had a good one, because this little bite was fantastic. Maybe it was the combo with the coffee. Highly, highly recommend a stop here, and if you're hankering for real food, you'll find yourself smack dab in a food cart pod. 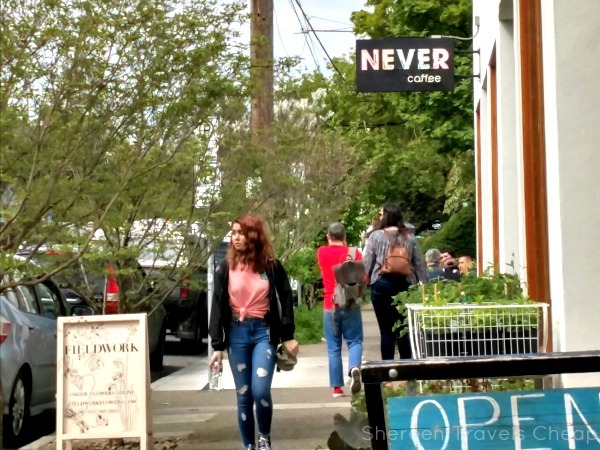 I found out about this shop in Portland Monthly magazine and have been really intrigued by their specialties, which include fantastic names like Rich Kid, Midnight Oil and Hug. To be honest, they all sound amazing, but I went with a coffee called The Holy Grail ($6). I know that price sounds outrageous for a 12oz coffee, but I would have paid more. This handmade coffee is made with turmeric, ginger, and orange blossom water. It's then topped with local cherry wood smoked honey, Jacobsen sea salt and tellicherry pepper. Oh. My. Coffee-loving heart, was this brew aptly named. I savored every drop of it. The salt and honey on top were perfect. Never Lab is small and they had run out of whatever pastries they may have had before I got there around 11, so I can't tell you about those. 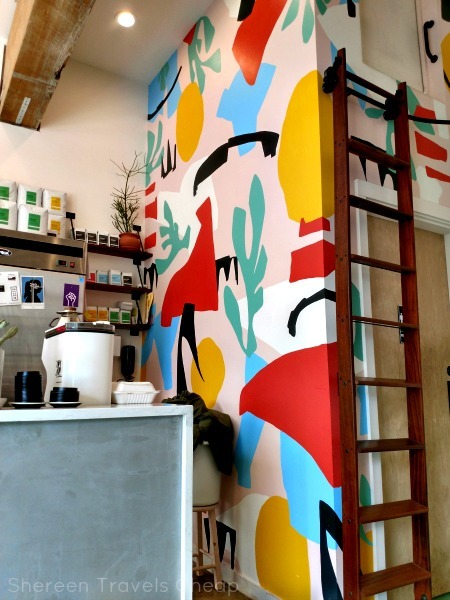 With just three tables inside and a few outside, there aren't a ton of places to sit, but if you can get one, you'll be surrounded by crisp, clean walls with a bright, colorful mural, plants and stunning vintage tiled floors. If you must get something to nosh on, half a block away is a food cart pod with tons of options. I picked up a breakfast bagel and couldn't believe how good it was...and I could barely finish it. All the thumbs up for both Never Lab and that pod. 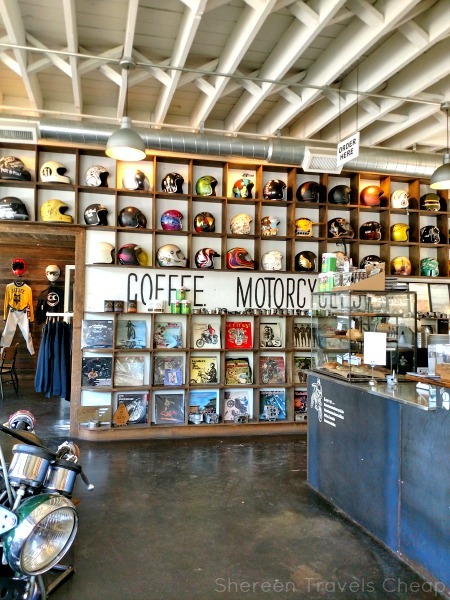 My mom got a new job near the end of last year and I've picked her up a few times to do things and I kept seeing a building that said Coffee & Motorcycles and I had no idea what it actually was, but finally looked it up and found out that it was a motorcycle gear shop (like you can buy your jackets and helmets and stuff there) and also included a coffee shop. Well, I'm not sure what I expected, but what I was met with when I actually went inside was quite different. I'm guessing this place used to be a bar, but now it's turned into a funky coffee bar with some food. I asked the barista about their specialty, because you always gotta know about those, and was told that the Coconut Latte #1 ($3.50) was the best-selling signature drink. It is served cold with citrus whipped topping and orange zest. 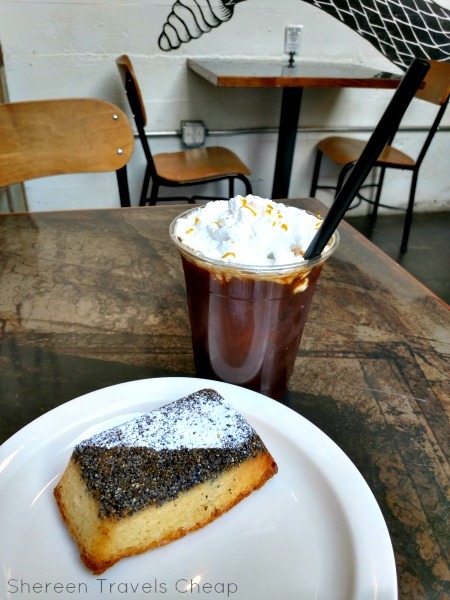 I opted for a poppy seed quick bread ($3.25) which was quite the same as one I'd had at another coffee shop. I thought perhaps the coffee was cold brew, as it had that taste that cold brew sometimes gets, though I actually liked it. It turns out it's just made with coconut milk. I sucked down my drink and opted to get another one to go, but I ordered an iced vanilla latte ($4.75) to take with me, which had a much better flavor to me, though I would try the coconut latte again. That's it for today. I'm hoping I can get out and try a few more shops, this coming month, but I have a busy schedule and a family emergency has cropped up, making it a possible back-burner thing. As it is, I may be missing my trip in July, but never fear, I've got a back-up solo travel plan for August or September instead. I'll keep you posted!